I also won the whitest legs division. Parker taking some swings at me. Seriously, I was really looking forward to doing this one. It’s no secret I love my dog like Ron Burgundy loves Baxter in Anchorman, so this race seemed to be a perfect fit. I typically run once a week with Parker; The problem is, he’s a massive Weimeraner and loves to take off at a sub- 5 minute pace, then promptly dies after 2 miles. Stamina is not his best card. But I was confident we could pull it together on race day. Race morning, Parker was AMPED UP.. I would be too if I were a dog surrounded by 600 other dogs on leaches about to run. There were 2 categories at this race, which took place at the Del Mar Racetrack; Runners with dogs & runners without dogs. They started the runners with dogs behind the runners w/o. I don’t think they’ll do that again. When the horn went off I noticed 3 other faster runners make a break to the outside and slip around the runners w/o dogs. Parker & I didn’t have such a brilliant strategy. We got caught behind what seemed like endless packs of old ladies speedwalking. Parker was so excited to run but he/we were engulfed in the crowd and ended up completely knocking over two or three old ladies and tripping up countless others. I stopped to help one angry lady up who only yelled and swore at me. What do you expect?? You’re running in a race with 600 dogs, how angry can you get? At this point I was content with just finishing the race via jogging. However, when we got outside of the race grounds and onto the road Parker wanted to bolt. I’ve never been so proud, honestly, he wanted to be in the front. So we wound up essentially running a ridiculous & unsustainable pace to catch up to the front 3 guys. I overheard people murmuring to others as we sprinted past, things like “come on, really?” or “that’s just stupid”. I had a smile on my face the whole time. I won’t say a ton about this but the TCSD race series is quite possibly the greatest race series ever.... 1. They’re free 2. All the local fast guys/girls come out to race these 3. They’re close by & convenient 4. Mega breakfast/buffet after 5. They have electronic timing 6. They’re free. I probably work harder in these races than I do in races that I pay a ton of money to do. It’s fun to race your friends, It brings out the better athlete inside of you. Not going to give a huge recap of this race but, like most people that do this, it wasn’t tapered for, so most have tired legs, which makes it all the more challenging. This was the 1st TCSD Duathlon of the year and it was out next to the Olympic Training Center. It consisted of a 2 mile run on a dirt path, 12 mile bike and the 2 mile run again. Loved this rolling bike course and it was clear that the cyclists owned the day here. Daniel Heineck, Matthew Dixon and myself basically pulled away (clean & no drafting) and put around 3 minutes on everyone else and ran away with the race. I ended up having a decent run and took 1st with Matt in 2nd and Daniel in 3rd. Oh ya, our times were in the low 50 minute range.. do the math on that one.. #fast. It was a fun morning and afterwards we had a nice little group together for a ride out to Honey Springs in some gnarley headwind. I’m eager to see my finishing video as I did my best karate kick/ hi-ya thru the finish line. I was really stoked for this, I’ve never really done a pure solo TT before. I did take the day off of running and cycling the day before and only swam. Race day, I needed to make sure I had a huge warm up in beforehand, as most of my cycling buddies will attest, I’m a definite 2nd half performer in cycling and take a ridiculously long time to get warmed up. So I started riding well over an hour before the race to make sure my legs were good and ready. Rolled up to the start line barely on time and let her rip. It was 3 big loops around Fiesta Island (4.1 mile loops). As I figured I would do, I took out the 1st lap much too hard, spent the 2nd lap worried and being way to conservative and probably made up everything I’d lost on the 2nd lap in the final lap. I was never really in the “hurt locker” & I couldn’t get myself to that level for some reason; I was just pushing a hard pace. The moment I finished, I sat up and thought: “damn, I could do that again right now, probably faster”, which isn’t the feeling you want to have in such a short hard effort. 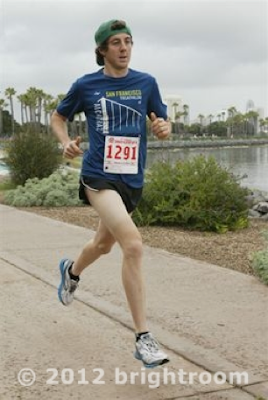 I was probably saving energy, subconsciously, for the run ;-) Finish time of 27:29, which was good enough to win the 19+ open division and a Personal Record for me. I was fairly happy with this time; and to me it means I’m slowly getting better in the flats and not just in climbing. Now I've got the hunger to do this again soon and break 27 minutes. I was NOT stoked for this race. On the morning, I woke up feeling pretty crummy & with heavy legs, having been sick and over-trained all last week. I would’ve gone back to bed and ditched this, but I would’ve never heard the end of it from Mike Clinch. When I arrived, my warm up was the run from my car to pick up my timing chip and number. That was a bad call. I was blown away with how many fast dudes came out for this one!! If anything, I learned more about how to run a 10k (or how not to run a 10k) rather than having a “good race”. I didn’t really know how to seed myself with all of these fast guys on the start line. I figured I’d just go out with the front group. That was all ‘well and good’ until we hit 2 miles and I wanted to die. Somewhere, maybe a minute or two before the 5k timing mat, I hit the wall and wanted to call it quits on this stupid thing. I then ran into my good buddy Mitch Hall crusin around on his bike and he gave me a bit of motivation to get moving again. My pacing goal was to stay somewhere around Lesely Paterson. She had been running in a little group 30+ seconds ahead of me for the last couple of minutes. My legs finally came back around somewhere between mile 3-4 and I found a suitable pace. Caught back up to Lesely and a few others and felt “alright enough”. I’d have had a really strong last ½ mile finish but I took a wrong turn and started running down a rain gutter path on the wrong side of a fence. Looking kind of embarrassed I turned around and ran back. I finished with a much slower time than expected in 35:18. I came in 25th place overall. Ya, wow, that’s demoralizing. I know it’s a PR and still really early in the season, but for some reason 25th place doesn’t sit too well with me. Lessons Learned, 10ks are hard, don’t go out blazing a fast 5k and leave nothing for the way home, don’t run the wrong way, there’s no “cheating” a 10k (like you can with a 5k). My first Triathlon of the season is Tritonman, next Sunday. I’m always excited for this little Collegiate race, since it was the 1st race I ever took part in back in 2009. Also really looking forward to the Desert International and SUPERSEAL in early March before Oceanside! Eager to add the swim... Fun times ahoy.